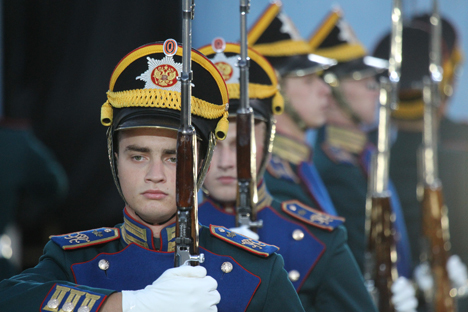 Bands from Japan, Britain, China and France will take part in the International Military Music Festival “Spasskaya Tower,” which takes place at Moscow's Red Square on September 1–8. In accordance with tradition, the opening of the festival in 2013 will be held within the framework of the Days of the City of Moscow. The daily festival audience in Red Square will exceed 7,000 people, and the entire festival audience is expected to be over 56,000 people—over 100 million people, if Internet and TV viewers are taken into account. RIR asked conductors of the orchestras taking part in the festival to talk about their plans and hopes. “The Massed Pipes and Drums from the British army are honored to be invited to perform at Spasskaya Tower—the Kremlin military festival on the renowned Red Square, before the magnificent backdrop of St. Basils Cathedral. “The Massed Pipes and Drums will provide a marching display of Scottish music and highland dancing. “The military tattoo is a wonderful opportunity to demonstrate pride and patriotism for one’s country; it also provides a beautiful military spectacle with stunning music and ceremony. “We are expecting an atmosphere of celebration and peace that will allow us to proudly represent our country while coming together with other cultures to mark this prestigious event in Russia. We will play a variety of Arab and international music, as well as perform various traditional dances and music routines that represent victory, pride and courage. “For both Russia and Japan, we are important neighbors, and we think we will have a lot of opportunities in the future to create a great partnership between us. But, so far, there are only a few interactions between us. So, we hope our dance show will be a reason of our friendship to become better and better. “This time, we will dance with Sansa-Dram. The dance will be very traditional, because it has history from the 16th century. “When we had the earthquake in 2011, Russia gave us huge support with a warm heart. This time, to repay this favor, and also to better the friendship between Russia and Japan, we will accept your invitation. “For us, attending the Spasskaya Tower festival will be the meaning of upward. We really think this is a precious opportunity. “Through our performance in the festival, the ROKAF band hopes to introduce our traditional Korean culture indirectly to everyone. In addition, it is South Korea's and Russia's 23-year anniversary of our diplomatic relations, and [we] hope to establish a cultural exchange between our two countries in the future. “For the festival, we have prepared music performances of various genres, from Russia's own composer Modest Petrovich Mussorgsky, ‘Pictures at an Exhibition,’ to the greatest Korean YouTube star Psy's Gangnam Style, to Korea's traditional Arirang music, and so on. We have prepared programs for the audience to join the ROKAF band and enjoy its performance.